Disk partition table is a service information that a regular user may need only during the Windows installation. But an advanced computer user may get a lot of useful information from the hard disk or SSD partition tables. For example, by hard drive partition table you can understand if you are looking at the old laptop or the new one. In this article we will tell you how to find out if there is MBR or GPT partition table on a hard disk. 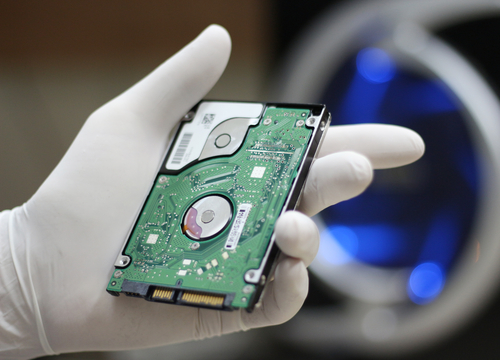 If we consider this issue briefly, it is worth saying that modern drives, both regular HDDs and SSDs, have a small code in the primary sectors. Operating system relies on this code when booting. This code is a boot record, and it includes a partition table – that is, information about the hard disk partitions. This code is called partition table, and it can be of MBR or GPT standart. It is worth knowing that GPT standard is more modern than MBR. For the first time, the MBR standard was introduced in 1983, and since then it has been technically obsolete. 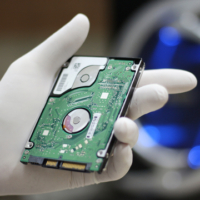 Since over the past few years, drives (HDDs and SSDs) have seriously evolved, the MBR standard is no longer suitable for them. The fact is that it is able to work with drives of no more than 2 TB, and the MBR format does not allow creating more than 4 partitions. In addition, it is a bit less reliable in terms of protecting data stored on the disk, and does not work with modern BIOS versions. As for GPT, this is a modern hard disk partition table. It doesn’t have the shortcomings that have been voiced above for the MBR. The limit for GPT partition table is 128, instead of 4 for the MBR. Also, discs with GPT partition table are suitable for working with UEFI – a modern version of BIOS. At the beginning of the article it was said that knowing the partition table, you can understand how modern your computer is. If it has GPT disks, we can say that it is quite modern. This can also be determined by the UEFI support. Using Windows PowerShell utility. In Windows 10, this utility, which serves as an analogue of the command line, allows you to get a lot of useful technical information about computer parts. In particular, through the PowerShell utility you can find out is there the MBR or GPT partition table on the disk. To do this, run PowerShell as an administrator and enter the get-disk command to display information about the disks. As you can see, in this example, two drives are used. The first one is a 111.78 GB SSD with GPT partition table (this is a system disk), the second one is a 1.82 TB HDD with MBR partition line. Using the command line. Command line also allows you to receive various technical information about all PC parts. In order to find the necessary information through it you are going to need to enter the diskpart command, then enter the lis dis command. Here the information is less obvious than in PowerShell. If the disk uses GPT partition table, then a star will appear in this column. If there is no star, this disk has MBR partition table. Using “Disk Management” utility. 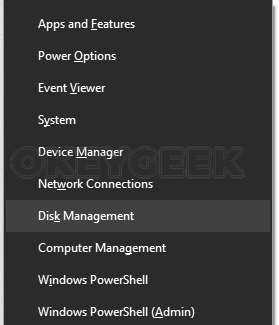 One of Windows 10 system utilities is “Disk Management”. You can start it by right-clicking on “Start” and selecting “Disk Management” in the drop-down menu. When utility opens you need to go to the properties of the disk of interest to find the necessary information about it. 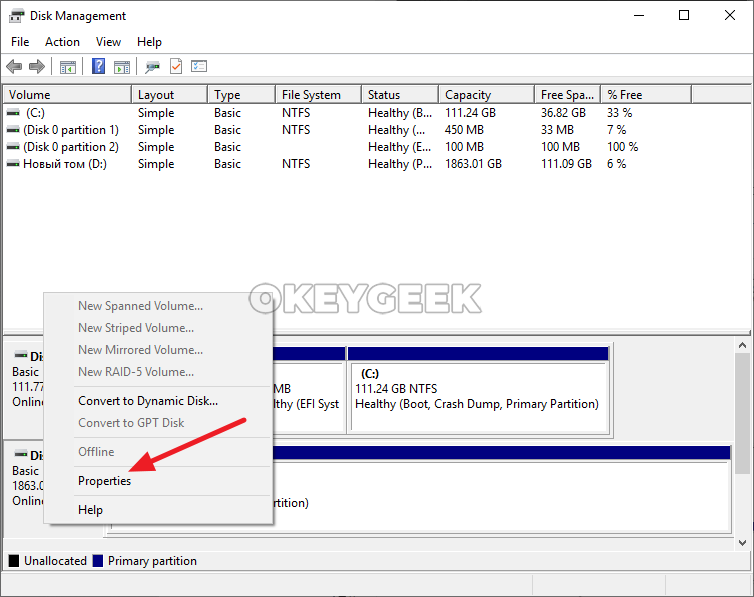 On the “Volumes” tab of the properties in the “Partition style” section there will be displayed information on the partition table of the disk. 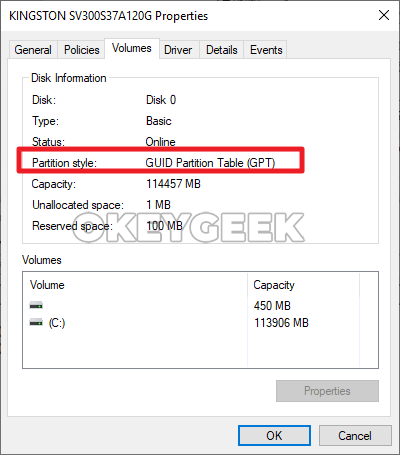 If it says “GUID Partition Table” – this indicates GPT partition. It is worth noting that there are a lot of third-party utilities that allow you to analyze PC parts and see whether there is GPT or MBR partition table on the drive.